This twenty-chapter novel has been adapted from John Bunyan’s famous allegory, Pilgrim’s Progress. 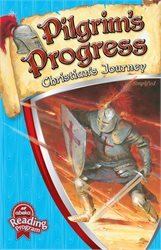 Inspire your students to follow the book’s hero, Christian, step by step through his rewarding journey to the city of Zion. This novel will not only capture students’ interests but encourage their hearts as well. Help your students improve their reading accuracy, enunciation, smoothness, alertness to punctuation, expression, and comprehension with this classic story!